Disbarred former Maricopa County Attorney Andrew Thomas maintained his longstanding insistence that he was unfairly targeted for taking on corrupt officials as he jumped into the 2014 governor’s race, attempting to revive his political career. Former Maricopa County Attorney Andrew Thomas announced in an email today that he will file paperwork to launch a 2014 gubernatorial campaign. A provision in the 1998 ballot measure that created Arizona’s Clean Elections system may hold the key to whether the state’s new campaign contribution limits will go into effect for 2014. The Attorney General’s Office is asking the Arizona Supreme Court to overturn a lower court ruling that said lawmakers violated the will of voters three years ago when they failed to increase education funding to match inflation. The state filed the appeal and argued that the Arizona Court of Appeals erred in its Jan. 15 decision in which it found that the 1998 Voter Protection Act allows voters to bind future Legislatures to take specific actions. The Arizona Supreme Court today denied a request to have the state’s preeminent medical marijuana lawsuit skip an appellate court review and move directly to the state’s high court, leading advocates of the system to declare victory in the more-than-two-year legal struggle over the voter-approved law’s legitimacy. The Arizona Supreme Court on Tuesday is scheduled to consider whether to accelerate consideration of an appeal of a judge's ruling that the state's medical marijuana law is constitutional. 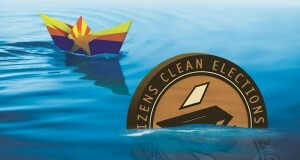 As fewer candidates choose to run for office using Arizona’s Clean Elections system, lawmakers are sensing the system’s vulnerability and are preparing to deal a death blow. The Arizona Supreme Court says a person who pleads guilty under a plea agreement has only very limited rights to challenge a restitution order that follows. As they grilled the lawyers arguing before them on the issue of whether police can collect DNA samples from unconvicted arrestees without a warrant, the justices of the U.S. Supreme Court acknowledged just how high the stakes are.